I spend an inordinate amount of time working in huge Excel spreadsheets that represent data about the worldwide PC monitor market. Excel's pivot tables and charts are useful, but sometimes I still struggle to find the trends buried in all those numbers. So I did what any geek would do: I looked for an app that could help me. I found Tableau Software, which recently launched version 4.0 of its Desktop and Server analytical software clients. Put simply, you point Tableau at your data file, and it creates an interface that lets you drag and drop elements of the data to create visual representations that can be easier to understand than Excel's own pivot tables and charts. In this simple example, Tableau lets me visually compare CRT and LCD shipments across years and across regions. Here's a simple example: My data shows that in recent years, CRT monitor shipments have declined steadily in all five of the global regions that I track, while LCD monitor shipments have been on the rise. To start creating a graphical representation of that trend in Tableau, I point the software toward the Excel file where all of the data is contained. After a few moments of processing, Tableau generates an interface that displays all the dimensions and measurements in my Excel file. I drag and drop dimension elements into the columns and rows in Tableau, and then the Units measure into the table itself; afterward, Tableau generates what looks like a pivot table. When I click the 'Show Me' button, the software shows a list of the possible visual representations it can offer based on the data set I've given it. For this example, I select the Circle chart. Tableau thereupon generates a chart using small orange circles or dots for CRTs and green ones for LCDs, graphically displaying four years' worth of sales results in a way that is easy to grasp (see the screen shot). And the graphic immediately shows me details such as when each region made the crossover from CRTs to LCDs as a majority of monitor sales. I can roll my cursor over the data points for more details. If I want to add another measure to the mix, such as the total revenue for LCDs and CRTs, I can simply drag that measure into the chart, and Tableau generates another visual representation. In this case, the size of the circles changes to represent the amount of revenues (Tableau also creates a new legend for easy reference). This is good, useful stuff, and it's just the tip of the iceberg. The more data you have, the more Tableau can provide in a graphical form. The company offers two versions of the Desktop application: the $999 Personal, which opens data from Excel, Access, and text files; and the $1800 Professional, which supports a longer list of sources and works with the Server product (about $20,000 for 20 users). The Server client lets you share and manipulate data simultaneously over a network. 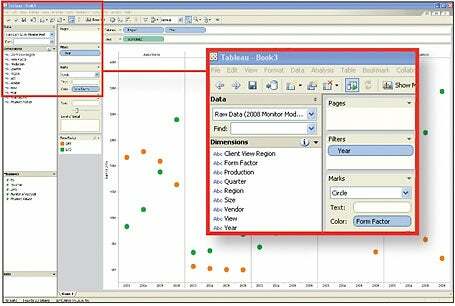 A free reader lets non-Tableau users view existing files. The pricing may sound a bit steep, but in the right hands Tableau can give significant insight into your data. The company offers a free 30-day trial of a full version of either Desktop application, so you can give it a spin before you buy. Getting the hang of it took me a short while, but the results were well worth the effort.